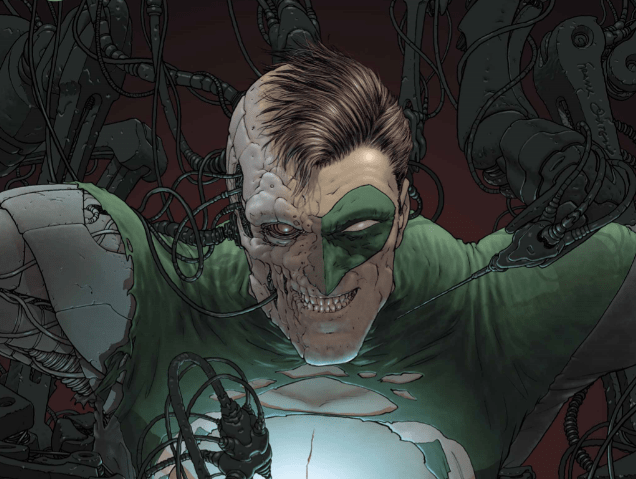 The Green Lantern #1 review – AiPT! Nobody panic. Hal’s got this. Hal Jordan, the greatest Green Lantern, is back and for the first time ever in the hands of superstar writer Grant Morrison. Alongside Morrison for the journey rides the psychedelic style of the exceptional artist Liam Sharp (The Brave and the Bold, Wonder Woman). This book easily has the most hype fans have seen for a Green Lantern story since Geoff Johns reinvented the mythos with the instant classic Green Lantern: Rebirth. The inception for Morrison’s series all began during a dinner date between the acclaimed writer and DC executive Dan Didio. At the dinner Morrison spit out a pile of ideas of what DC could do to move the character forward and after initially claiming he was too busy, Morrison caved and agreed to write the book. “It took Grant Morrison one week to put together outlines for 12 issues of The Green Lantern. Just crazy.” Said Didio on Morrison and The Green Lantern at New York Comic Con in October early last month. “Crazy” is as good a word as any to describe how our tale begins, and with Morrison behind the wheel, it feels like we’re right where we should be. I’m four pages in and it feels almost as if someone dropped me back into the 80s. The drawing and colors are shouting Silver Age comics and as the story progresses Morrison’s writing reinforces that. But before I get ahead of myself, let’s talk about the story itself. Green Lantern Maxim Tox of sector 2018.2 is battling a vegan arachnid space pirate and several other notorious space faring swashbucklers, alongside his microscopic partner — Green Lantern Floozle Flem, a super-intelligent virus. I particularly enjoyed the hilarity that is a giant spider space pirate yelling “Ye’ll never catch us now, copper!” as he rides off in his getaway car, only to be stopped by a snot and diarrhea-generating Green Lantern. The pure ridiculousness of the scenario is wonderful and so unlike anything I’ve seen out of the Green Lantern universe in longer than I can remember. It’s not long before the Green Lanterns have the baddies in hand and Tox is off to right more wrongs. Unfortunately his next assignment doesn’t go as well as his first and he runs afoul of an unknown lethal being out of the anti-matter universe. Which brings us our first look at the man we’re all here to see, Hal Jordan. An unknown event has left the greatest Green Lantern stranded on Earth due to a status of persona non grata on Oa. But it isn’t long before he’s back in the cosmic cop uniform via a déjà vu event where he encounters Chriselon, a crystal based Green Lantern, whose ship has crashed on Earth and is gravely injured. Watching Hal recite the Green Lantern oath and suit up was just as epic as I was hoping for — credit to Sharp for sending goosebumps down my spine. It felt like watching two old friends reunite after a long time apart. It reminded me of the first time I read Roland Deschain recite the Gunslinger’s oath. You’re filled with a sense of majesty and glory as awe courses through you. Beware Liam Sharp’s power. Hal feels disconnected from himself and the rest of the world when he isn’t wearing a charged power ring. It’s like the conductor rod that keeps the two pieces of himself — the human test pilot Hal Jordan, and the greatest Green Lantern Hal Jordan — is powered off. Hal’s not meant to do anything else in life besides be a Green Lantern and as we’ve seen time and again throughout the years, he just isn’t whole without it. I’ve always felt Hal’s greatest strength and his greatest weakness was the purpose being a Green Lantern gave him, and Morrison nailed that aspect of the character. Hal Jordan is the greatest Green Lantern in the history of the corps, but he’s sacrificed every relationship in his life to attain that. Morrison has delivered exactly what he said he would, a story about the core of what a Green Lantern is — a space cop. But that makes this story sound simple and it’s anything but. Right out of the gate we’re absolutely loaded with a magnitude of new characters to ingest — new Green Lanterns, new bad guys, the appearance of a long time rival of the Guardians and the clever eye will catch a link to another ongoing DC event. There’s a lot to take in here and if fans are expecting a clean handoff from where Robert Venditti left things, you won’t be getting that. Which on one hand can be good for new readers, as they won’t have to read any back issues to get up to speed, and it makes this story accessible for everyone. That being said, I can see how regular readers could raise issue with the passing of the baton, as there are really no clues for how Hal ended up in his current circumstance from when we last saw him. Admittedly, I had to read this comic twice before I felt like I had a solid understanding of things. But trust me, if you can relax your continuity filters a bit you will happily take in the majesty that is Liam Sharp and Grant Morrison’s The Green Lantern. Sharp and Morrison delivered a fun, wacky, psychedelic space cop experience that’s by all appearances going to take Hal Jordan back to the core of what being a Green Lantern is all about. Admittedly, I had to read this comic twice before I felt like I had a solid understanding of things. But trust me, if you can relax your continuity filters a bit you will happily take in the majesty that is Liam Sharp and Grant Morrison's The Green Lantern. Sharp and Morrison delivered a fun, wacky, psychedelic space cop experience that's by all appearances going to take Hal Jordan back to the core of what being a Green Lantern is all about. New lanterns and new evil doers right out of the gate. Morrison delivered just what he said he would, a space cop dealing with space criminals. Mind blowing otherworldly environments and the tangible glory that is a Green Lantern charging his ring -- Liam Sharp makes it look as amazing as it sounds. Art and writing give a hilarious tip of the hat to the Silver Age. You may need to read this one twice to feel like you've got a good grasp on it. The handoff between Venditti and Morrison could have been better.